Some would claim this column has been obsessed with Royalty. I guess they might have a point. So let’s move on to the sub-royal department and look at the appointment of a new Governor General. Picking a new Governor General is a serious task. Prime Minister Trudeau visited the Queen at her official Scottish residence last week, amid rumours he was presenting his choice for her approval. Indeed, the incumbent has already overstayed his original tenure, but not his welcome by two years. So by the time you read this, news of the appointment may well have become public. What criteria will Trudeau use to choose the nominee? Only a complete cynic would think he would appoint someone in order to shed some political baggage, settle a favour owed or sideline a rival. Prime Minister Trudeau is much more likely to employ nobler criteria. Perhaps, he can make a decision based on representativeness. Representative of what is the question. Francophone and Anglophone appointees have taken turns over the past few decades, but the pattern is changeable. Prime Ministers have appointed women and men, but not in strict sequence. Trudeau may tell his people to break the mold and find him a person to whom both official languages represent a challenge and that does not identify with either traditional gender. Moreover, she or he should be under forty years of age, left handed and a non-smoker. Who knows what his criteria are? Perhaps, a new Governor General might represent the homeless class. If we’re casting about for criteria, what about choosing a Governor General that represents homelessness? It would reduce the problem by at least one person. Yet, choosing a person based on what he or she represents demeans both the office and the appointee. I know I wouldn’t like it if I were appointed and people said, “Oh, he’s just there because he’s an immigrant [from the UK], resides in Prince Edward County and shook hands with a woman that shook hands with the Prince of Wales.” I prefer appointment for who I am, not what I am. More than that, the job carries certain responsibilities. It’s not enough to be ‘representative.’ A serious candidate must have the right kind of stuff to perform well in the job. What kind of stuff would an appointee have to possess? You would have to be polite, personable, down to earth and quick on your feet. You would have to enjoy the rituals of office. Such rituals include riding in an open horse-drawn carriage on a freezing winter day to turn on the festive lights on Parliament Hill. Cutting ribbons so often you develop carpal tunnel syndrome. Making earnest speeches that demonstrate your ability to stay politically neutral and plastering your face with a winning smile for pictures with people you have never met. Hosting state dinners to honour ruthless dictators, inspecting troops contracted to guard your feet and so on. When appointed, you and family would also have to be prepared to live in a publicly funded fishbowl, on a taxable salary of $290,600. Of course, your personal history would have to be free of any blemishes. Imagine the indignity of being forced to resign because an investigative report found you had cheated at marbles in grade three and kept silent about it ever since. Finally, a working knowledge of Canadian political and constitutional history might be handy. You can’t expect an ignoramus to waltz in and become head of state of a major North American country. If showing you have the right kind of stuff is so important, why should Prime Minister Trudeau limit his choice to someone that meets some artificial ‘representativeness’ criteria? Why not throw the position open to the wide swath of ordinary Canadians; those that can show they have the right stuff? Trudeau opened up Senate vacancies in this way. A quarter million letters of application arrive. The PMO staff must burn the midnight oil, winnowing the applications to a hundred! The Prime Minister picks the winner at random from the shortlist! Where’s the harm? It sounds like democracy at work to me. The risk is all on the upside. Opening the position to applicants might show there is a public and private partnership opportunity waiting for mining. What manufacturer of breakfast cereal would not give its eyeteeth for the placement of a Governor Generalship application form on the back of its box, in both official languages, of course? What maker of bath soap could resist becoming the lead sponsor of a prime time television special to reveal the identity of the winner? I suppose you could argue that if Prime Minister Trudeau is ready on the democracy angle, he could take a poll and abide by the results. Then, your average Ethel Snodgrasses and Joseph Ordinaires would stand little chance against your more widely known Christine Sinclairs and Peter Mansbridges. Moreover, you risk encountering the “Boaty McBoatface” problem, wherein a joke suggestion won a British contest to name a new scientific research ship. If the Canadian public has its say, Don Cherry will reside in Rideau Hall. The British Government declined to accept the result and named the vessel after Sir David Attenborough instead. 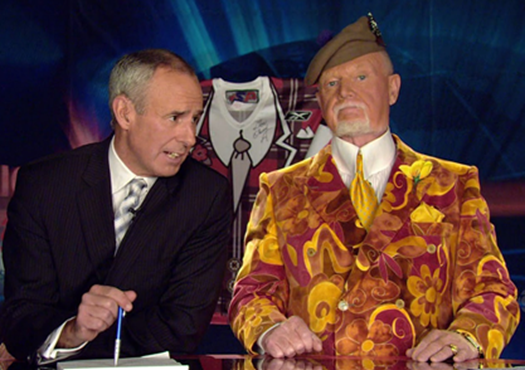 In Canada, you may end up with a tidal wave supporting Don Cherry. Although there may be some negatives to his selection, on the plus side, the incandescence of his suits would certainly help reduce the lighting bills at Rideau Hall.